I found this link on Darin's site. Surging energy prices, low personal savings and the higher cost of borrowing have combined to produce a record level of overdue credit card bills. Today's Chronicle front page cover story is about a new study that estimates what it costs for a family to "make it" in California. The gap between high-income and low-income Americans is widening, the ranks of the poor in California and nationwide are swelling, and middle-class workers have lost ground compared with the 1970s, several national and state studies show. 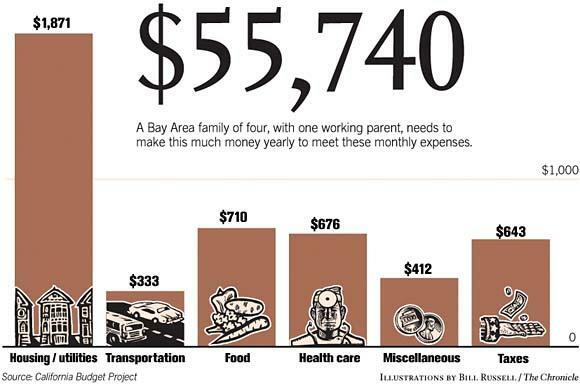 The study finds that a Bay Area family of four, with one working parent, needs to make $55,740 a year just to meet the following monthly expenses: housing/utilities, transportation, food, health care, taxes, and miscellaneous. 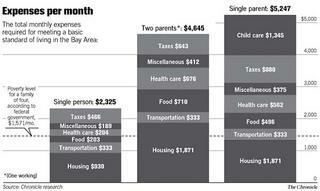 Note that this does not account for home ownership, but only renting! Historians are likely to pinpoint Mr. Warren's trip to Rwanda as the moment when conservative evangelical Protestantism made questions of social justice central to its concerns. Given his huge wealthy Orange County congregation, Rick Warren could have become satisfied with his national success and ignored problems abroad. Instead he has chosen to make issues of global poverty central to his ministry and for that he deserves his identification by Time magazine as one of the most important evangelicals in America. Does anyone know how to prevent anonymous postings of comments? I'm starting to get blog spam - although I did appreciate the comment that I have a beautiful mind! What? I saw this on CNN a couple of nights ago. Regardless of whether or not there are right and wrong answers here, this much division should be cause for concern. Yesterday I lost my keys! We've looked all over this house - no keys. Perhaps my luck will change tomorrow. I've been watching those Jesus movies over and over. I just laugh and laugh. This one's awesome. I envision a life with less fast food in the car and more spreads of home cooking with family and friends. Shoving burritos in our mouths while driving can't be what God had in mind for us. We have lost the beautiful art of sharing a meal together. I want to regain that art. This is from the introduction to Randy Frazee's book Making Room for Life. I started reading it last night. This Friday night we are starting the Cooperative Kitchen back up. We'll be meeting every other week at a church in the Lake Merritt area of Oakland. There are several reasons why we started the Kitchen. 1. Our eating habits are not as nutritious as they should be. 2. Many people do not know how to cook. It could be said that we're a little intimidated by the kitchen. 3. Because of these two reasons, we tend to eat out a lot, which either is really expensive, or, if it's not, is quite bad for your body (Did you see the documentary Super Size Me?). 4. If we do eat at home, more often than not we're not together. It's difficult to find time for everyone to sit down at the table and share a meal together. The Cooperative Kitchen exists to empower people to live (w)holistic by providing fresh, healthy, and delicious meals for one another and to people who are time-starved, budget sensitive, health conscience, and/or environmentally aware. Mandy, Adam and I spent this weeken in Calistoga with about a dozen members of our worship team at Hillside. We played music together, ate some great food, played a little poker, and all in all just got to know each other a little better. This was our first getaway with Adam, and, though it was a little difficult at times, I think it went quite well. This weekend I also came across two videos. One is about New Orleans. It's from a church in Houston called Ecclesia. It's a very powerful video, and was for me tonight a somber reminder not only of Katrina but also of 9/11. The second is much lighter. It was recommended to me by my friend Emory Mann. It's from a church in Raleigh, NC called Vintage 21. The videos deal with our preconceived notions of Jesus. Funny, funny! Once again, these are downloads. There are two other movies on their site. These were my favorites. A word of warning: some might see these as a little irreverant. They're definitely comedic, and I think they get their point across. Here's a good article from Christianity Today that you should take a look at. Like most Americans, I've been watching a lot of news lately. Like everyone else, I've wondered what exactly I should do about this tragedy in the Gulf Coast. I have felt that most people desperately want to help, but just don't know how. At times like these we want leadership that will take charge of the situation and assure us that everything is going to be ok. I have seen several interviews with our president, and have not been convinced that he thinks everything is going to be ok. I don't want that to sound too harsh. I can't imagine being in his shoes at this point, and believe that this would be difficult for any person. Further, no one could have predicted that this would happen. Most people do not know how to respond, but true leaders should. They may get a few things wrong, but they will continue to make decisions, because during times like these it is essential that decisions be made. I remember after 9/11 that Rudy Giuliani showed himself to be a true leader. When tragedy struck, he responded. He made decisions. He reassured the people. The following is taken from a Time Magazine article, in which he was named Person of the Year in 2001. Sixteen hours had passed since the Twin Towers crumbled and fell, and people kept telling Rudy Giuliani to get some rest. The indomitable mayor of New York City had spent the day and night holding his town together. He arrived at the World Trade Center just after the second plane hit, watched human beings drop from the sky and--when the south tower imploded--nearly got trapped inside his makeshift command center near the site. Then he led a battered platoon of city officials, reporters and civilians north through the blizzard of ash and smoke, and a detective jimmied open the door to a firehouse so the mayor could revive his government there. Giuliani took to the airwaves to calm and reassure his people, made a few hundred rapid-fire decisions about the security and rescue operations, toured hospitals to comfort the families of the missing and made four more visits to the apocalyptic attack scene. I don't feel that we've seen this type of leadership from our top levels of government this past week, and I believe that this has in turn hindered our relief efforts. With leadership comes great responsibility. Fortunately we have seen great leadership during this time. Alabama governor Bob Riley's "Operation Golden Rule" is a detailed plan to help those who have lost homes due to Hurricane Katrina. We've also seen numerous citizens inspired to be creative in finding ways to help. On Saturday I was watching Wolf Blitzer, and he read a few emails from people with some really great ideas. One of those was a man from Salem, N.C., who wrote saying that all of the churches in his town had come together to adopt a town in Southern Mississippi. Can you imagine what they will be able to accomplish? Or the lives that will impacted through their imagination and cooperation? This kind of creativity is to be applauded, as well as copied. It's exciting to see churches working together, and we have a wonderful opportunity to change our image here in America.